Billy's attempt to make Alexa drop the case against Lola backfires. 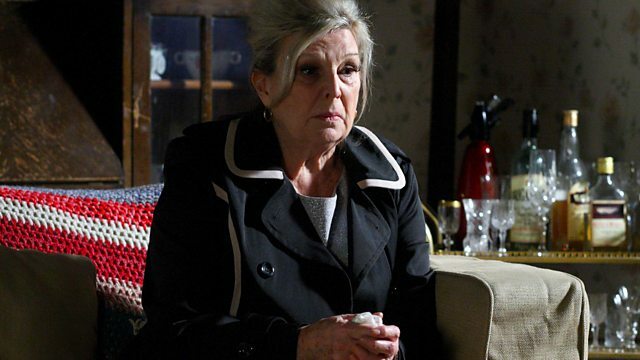 Tanya tries to uncover the reason for Cora's erratic behaviour and she is stunned by what she discovers. Syed gives up the flat. With Christian’s departure imminent, Zainab and Lucy lure Christian and Syed to the deserted Argee Bhajee and lock them in. Forced to talk, Christian recalls all of Syed’s past lies. Syed insists their wedding day was the happiest of his life and repeats his wedding vows as tears run down Christian’s face. Zainab peeks in, gleeful that her plan worked. Post-coital, Christian and Syed hold each other. Christian suggests Syed come to America; Syed refuses - he won’t keep hurting Christian. Christian departs for the airport while, at the Masoods’, Zainab admits she broke her pact by meddling but can’t stand seeing Syed unhappy. Syed has a change of heart and races to the tube station but there’s no sign of Christian. He returns to the Square to find Christian waiting – he couldn’t go without Syed. Masood tells Syed to return their money when he can. Syed and Christian bid their families goodbye and leave the Square, hand in hand. Cora’s ashamed when Billy berates her for telling Lola to give up on Lexi. She gets drunk in the Vic, shrugs off Patrick’s help but accepts Tanya’s. Cora slurs that she loves Tanya and apologises for lying about her sister. Tanya worries to Patrick, realising it would have been Ava’s birthday recently. Patrick reveals Ava’s alive. Lola spots Alexa at the playground and goes for her; Jay holds her back. Sharon agrees to give Billy part time work in R&R. Billy worries about her arrangement with Phil; Sharon insists it’s purely short term. Billy appeals to Alexa to give Lexi a chance. Lola’s angry that Billy’s made everything worse. Derek’s annoyed when Tanya smirks about his humiliation with Jackie Bosch. Derek tells Max ‘they’ want more cash and offers to help Max if he kicks Joey out.